Because I had to keep my myself from facing the fact that Harry Potter is finally over (sniff, sniff), I decided to round up my stats for the second quarter of 2011. Too bad for me, the digits I came up with aren’t exactly the best pick-me-uppers. I had a total of 18 trade ideas but only half of those got triggered. From all my triggered trades, 5 of them ended up as winners while the remaining for closed as losers. Although I had a net total gain of 65 pips from my 9 trades, my account is actually down 0.53% for the quarter. The negative figure felt like a slap in the face compared to my 2.28% gain during the first quarter of the year. When I realized this, I almost immediately started to regret calculating my stats. But I guess I have to learn to face the music if I really want to make it as a trader. What I first I noticed was that my average loss per trade is bigger than my average win per trade. This suggests that I usually lost on trades in which I seemed more confident in putting bigger position sizes. On the other hand, I risked relatively smaller positions in my trades that ended up as winners. I might have been able to up my winners had I held on to my pinky promise before to maximize my profits by adding to my winners. Aside from that, I could have been more flexible with my entries. I think I could have gotten a couple more winners if my triggers weren’t so conservative. As for my HLHB system… well, it didn’t really bring any bad news, but it didn’t bring any good ones either. It basically avoided a fake out earlier this week. 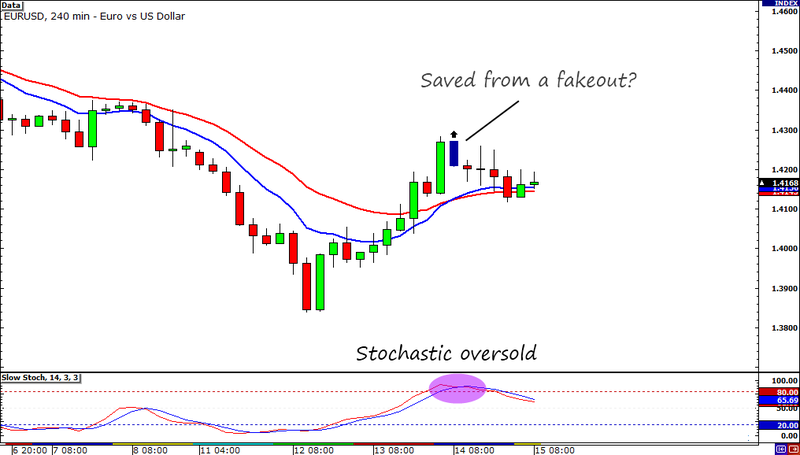 As you can see from the chart, there was a crossover but the Stochastic was already at overbought territory and the candle following the crossover candle did not meet my 20-pip filter. Alright, that’s it for this week folks. but before I go, let me just plug my brand new Google+ account! If you have one, add me to your circle! Now, if you don’t like Google+, you can also find me in Facebook and Twitter (@LoonieAdventure). See you next week loves!